Perhaps finally real progress from World Diplomats? EVEN as a red dust storm was reminding Sydneysiders yesterday of climatic threats to life on Earth, hopeful signs of a change in the global diplomatic climate were emerging in New York. Only incurable optimists are confident this week's one-day climate summit at the United Nations headquarters has ensured success at the December Copenhagen talks that are supposed to produce a more effective international deal to replace the deficient Kyoto Protocol, expiring in 2012. But at least the New York gathering of leaders seems to have provided the ingredient that had been so notably lacking: momentum. Appropriately, although belatedly, the major players this week were the leaders of the three largest polluting nations - the United States, by far the most powerful of the industrialised states, and the two developing giants, China and India - all of which have until now not only stayed outside the ''Kyoto club'' but also (like Australia) dragged their feet in responding to the global challenge. True, the speeches by Presidents Barack Obama and Hu Jintao and India's Environment Minister, Jairam Ramesh, were all stronger on rhetoric than on detailed commitments. But each was focused on what their nations were prepared to do, rather than simply demanding that others do more. This was a real change. Hu promised China would try to cut carbon emissions by a "notable" margin by 2020 - without putting a number to it - and to "vigorously" develop renewable energy and plant many trees. Ramesh pledged aggressive cuts to India's emissions. Obama acknowledged the responsibility of developed nations for the climate damage over the past century, pointed to his efforts to encourage energy efficiency and renewable energy, and hoped to do more (if the US Senate agrees). Even more remarkable was the target set by Japan's new Prime Minister, Yukio Hatoyama: a cut in carbon emissions by 25 per cent by 2020, in contrast to the previous conservative government's 8 per cent. Much of the credit for this week's potential breakthrough - it is no more than that - must go to the UN Secretary-General, Ban Ki-moon, who convened the meeting. 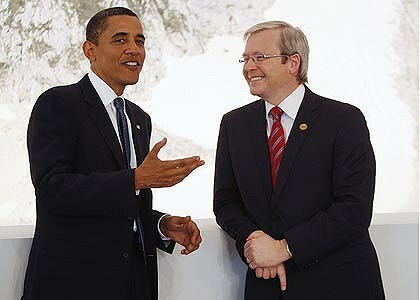 But Australia's Prime Minister, Kevin Rudd, and his Climate Change Minister, Penny Wong, also deserve their modest share of the limelight for their vigorous promotion of a "grand bargain" between developed and developing countries under which, in a post-Kyoto regime, less mature economies would face more flexible targets. That said, present indications are that Copenhagen will not be the promised end to this messy process, but just another step on the way.